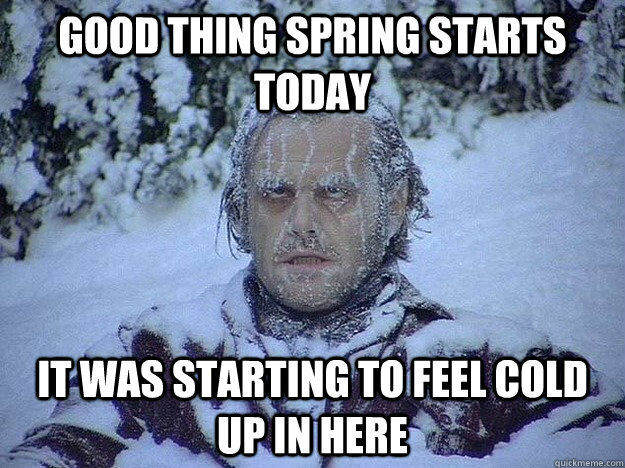 Happy First (Cold) Day of Spring! | Coach Billy. So today is supposed to be the first day of Spring. Everyone says that it’s the time of the year when the temperature doesn’t go below +6 degrees Celsius. But it seems like winter is here to stay! The past few days have been gloomy and yesterday we had freezing rain (with reported small ice pellets) in minus 4 weather. The weather.com even predicts a “Spring Snowstorm” coming this weekend! The tall snow banks and icy roads have been melting, but I’m not putting my hopes up. It seems like winter is here to stay — or we’ll just have a freezing cold Spring. Keep warm and HIIT it!